Text: I was at one of their Play-houses where I saw a Comedie acted. The house is very beggarly and base in comparison of our stately Play-houses in England: neyther can their Actors compare with vs for apparell, shewes and musick. Here I obserued certaine things that I neuer saw before. For I saw women acte, a thing that I neuer saw before, though I haue heard heard that it hath beene sometimes used in London, and they performed it with as good a grace, action, gesture, and whatsoeuer convenient for a Player, as euer I saw any masculine Actor. Also their noble and famous Cortezans came to this comedy, but so disguised, that a man cannot perceiue them. For they Wore double maskes upoon their fates, to the end they might not be scene: one reaching from the toppe of their forehead to their chinne and under their necks; another with twiskes of downy or woolly stufFe couering their noses. And as for their neckes round about, they were so couered and wrapped with cobweb lawne and other things, that no part of their skin could be discerned. Upon their heads they wore little blacke felt caps very like to those of the Clarissimoes that I will hereafter speak of. Also, each of them wore a black short Taffata cloake. They were so graced that they sate on high alone by themselues in the best roome of all the Play-house. If any man should be so resolute to unmaske one of them but in merriment onely to see their faces it is said that were he neuer so noble or worthy a personage, he would be cut in pieces before he should Come forth of the rooms, especially if he were a stranger. I saw some men also in the Play-house, disguised in the same manner with double visards, those were said to be the fauourites of the same Cortezans: they sit not here in galleries as we doe in London. For there is but one or two little galleries in the house, wherein the Cortezans only fit. But all the men doe sit beneath in the yard or court, euery man vpon his sevrall stoole, for the which hee payeth a gazet. Comments: Thomas Coryat (c.1577-1617) was an English traveller and travel writer. His journeys across Europe and Asia were documented in two lively volumes, Coryat’s Crudities (1611) and Coryats Crambe (1611), which were immensely popular. This passage records a visit to a theatre in Venice. 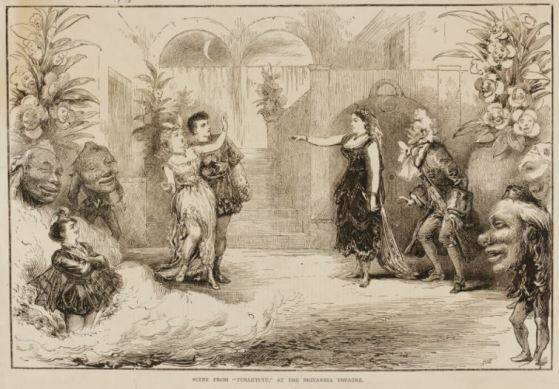 There were professional women actors in Italy from the sixteenth century, but women did not appear on stage in Britain (except possibly in medieval times) until 1660.